What Are Roche’s Key Sources of Revenue? Roche’s (NASDAQ:RHHBY) key sources of revenues are oncology drugs, autoimmune drugs, virology drugs, ophthalmology drugs, neuroscience drugs, and in vitro diagnostics. 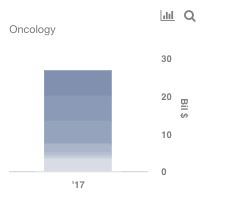 Oncology drugs accounts for close to 50% of the company’s overall revenues. Within oncology, company’s blockbuster drugs have been Herceptin, Avastin, and Rituxan, with sales of over $19 billion, or 35% of the company’s overall revenues. However, the sales of these drugs have slowed down, as they approach patent expiry. Roche has been strategic in defending the sales of these three drugs so far, by getting approval for adjuvant therapies and combination therapies. Nevertheless, we expect these drugs to see only minor declines for next 2 to 3 years, which is when they are expected to lose their patent exclusivity in the U.S. and make way for potential entry of biosimilar versions. Rituxan has already lost its exclusivity in Europe in 2017 and faces biosimilar competition. Having said that, we expect Roche to still continue to grow its oncology drug sales, as the revenue lost in the above three drugs will be more than offset by its newer drugs, including, Tecentriq, Perjeta, and Kadcyla. Looking at 2018, we estimate the oncology drugs to grow 3.6%, and expect the earnings of $2 per share. 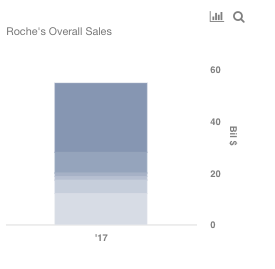 We have created an interactive dashboard that shows Roche’s key revenue sources, and the expected 2018 performance. You can adjust the revenues and multiple to see the impact on earnings. How Do We Expect Oncology Segment To Shape Up In 2018? Our price estimate of $36 for Roche implies a premium of around 20% to the market.